This generated poem takes a deceptively simple concept and executes it beautifully. 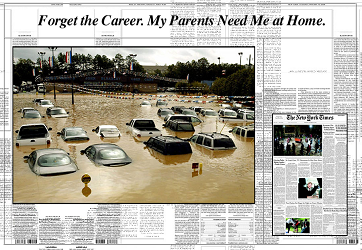 It harvests headlines and cover images from the New York Times published between 2005 and 2006 and randomly combines them to create a mock cover. This juxtaposition of text and images re-contextualizes both to create an incisive and occasionally humorous comment on the content of news coverage at this time in American history. Because the images refresh every 6 seconds, the sequence created between headlines form a kind of poetic text, a layering of lines over time that forms fascinating streams of compressed, verse-like texts. By providing images of the front page of the NY Times, she reminds us of the original context, which we are now predisposed to read with ironic detachment. For more on how Zellen conceptualizes this piece, take a look at the source code, particularly the keywords she uses to describe the piece. For a more detailed reading of this piece, read C. T. Funkhouser’s New Directions in Digital Poetry.